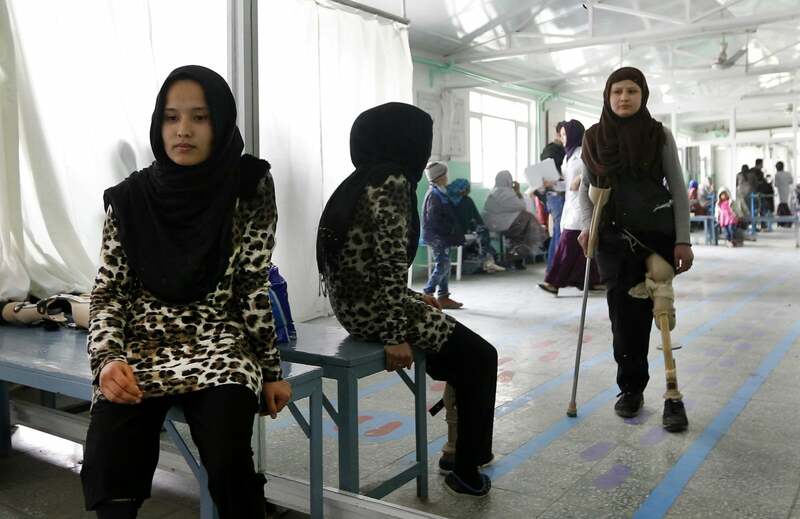 epa06543837 Afghan handicapped women practice their new artificial legs in the pediatric center of the International Committee of the Red Cross (ICRC) in Kabul, Afghanistan, 19 February 2018. More than 10 thousand civilians lost their lives or suffered injuries during 2017, according to the latest annual UN report on 15 February 2018 that documents the impact of the armed conflict on civilians in Afghanistan. EPA/HEDAYATULLAH AMID Dostawca: PAP/EPA. Jak wynika z raportu ONZ, tylko w 2017 roku ponad 10 tysięcy cywilów odniosło obrażenia, które spowodowały ich niepełnosprawność. Tak wygląda rehabilitacja tych ludzi. 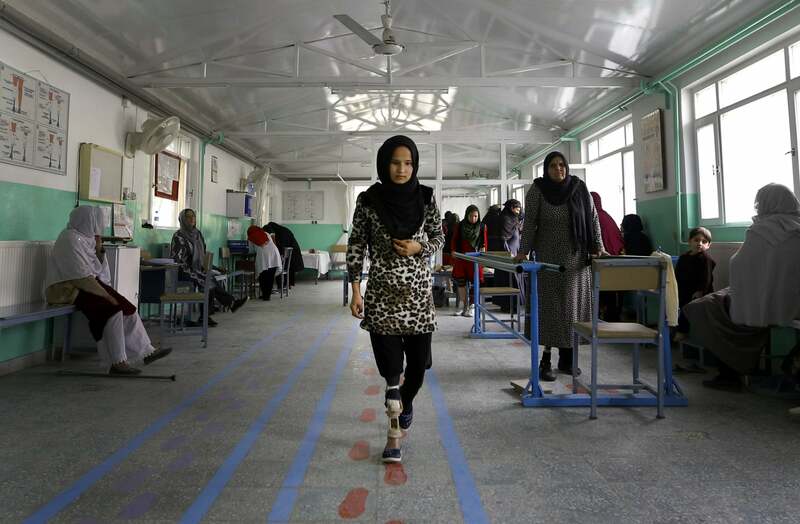 epa06543835 Afghan handicapped women practice their new artificial legs in the pediatric center of the International Committee of the Red Cross (ICRC) in Kabul, Afghanistan, 19 February 2018. More than 10 thousand civilians lost their lives or suffered injuries during 2017, according to the latest annual UN report on 15 February 2018 that documents the impact of the armed conflict on civilians in Afghanistan. EPA/HEDAYATULLAH AMID Dostawca: PAP/EPA. epa06543836 An Afghan handicapped boy practices his new artificial legs in the pediatric center of the International Committee of the Red Cross (ICRC) in Kabul, Afghanistan, 19 February 2018. More than 10 thousand civilians lost their lives or suffered injuries during 2017, according to the latest annual UN report on 15 February 2018 that documents the impact of the armed conflict on civilians in Afghanistan. EPA/HEDAYATULLAH AMID Dostawca: PAP/EPA. 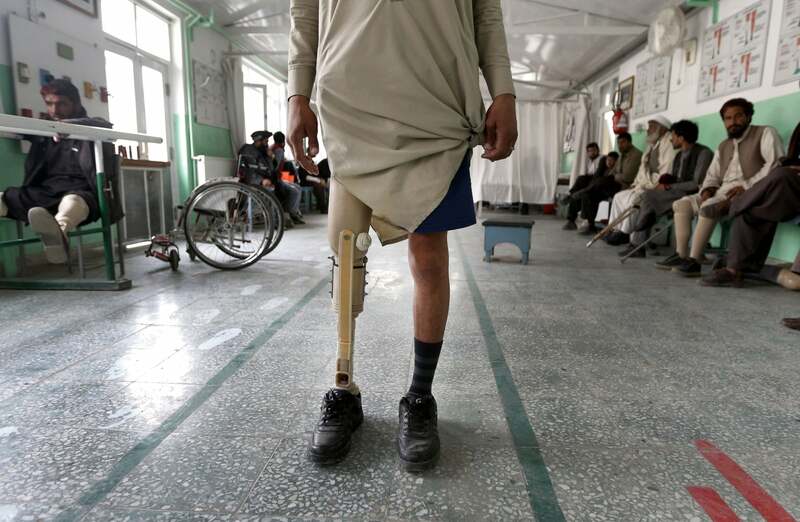 epa06543838 Afghan handicapped men practice their new artificial legs in the pediatric center of the International Committee of the Red Cross (ICRC) in Kabul, Afghanistan, 19 February 2018. More than 10 thousand civilians lost their lives or suffered injuries during 2017, according to the latest annual UN report on 15 February 2018 that documents the impact of the armed conflict on civilians in Afghanistan. EPA/HEDAYATULLAH AMID Dostawca: PAP/EPA. 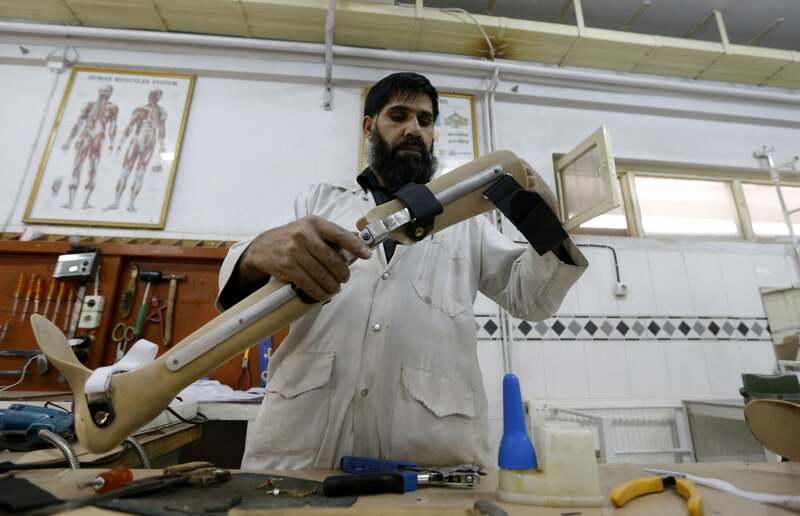 epa06543839 An Afghan handicapped man practices his new artificial legs in the pediatric center of the International Committee of the Red Cross (ICRC) in Kabul, Afghanistan, 19 February 2018. More than 10 thousand civilians lost their lives or suffered injuries during 2017, according to the latest annual UN report on 15 February 2018 that documents the impact of the armed conflict on civilians in Afghanistan. EPA/HEDAYATULLAH AMID Dostawca: PAP/EPA. epa06543841 Afghan pediatricians work at the lab of artificial hands and legs in the pediatric center of the International Committee of the Red Cross (ICRC) in Kabul, Afghanistan, 19 February 2018. More than 10 thousand civilians lost their lives or suffered injuries during 2017, according to the latest annual UN report on 15 February 2018 that documents the impact of the armed conflict on civilians in Afghanistan. EPA/HEDAYATULLAH AMID Dostawca: PAP/EPA. 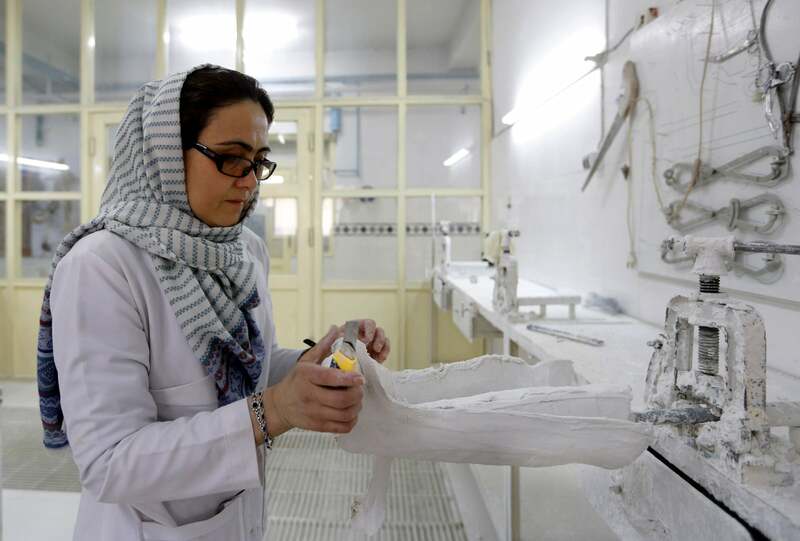 epa06543842 Afghan female pediatricians work at the lab of artificial hands and legs in the pediatric center of the International Committee of the Red Cross (ICRC) in Kabul, Afghanistan, 19 February 2018. More than 10 thousand civilians lost their lives or suffered injuries during 2017, according to the latest annual UN report on 15 February 2018 that documents the impact of the armed conflict on civilians in Afghanistan. 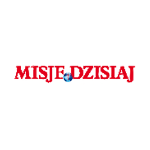 EPA/HEDAYATULLAH AMID Dostawca: PAP/EPA.